Growing up in Tulsa, Oklahoma, Fox received some early lessons in fairness and privilege that informed her research on social problems and eventually criminal justice. After attending a private Catholic elementary school, she volunteered to be bussed to Booker T. Washington, a racially and socio-economically integrated high school on the other side of Tulsa. She observed that only when white middle-class students were bussed in did the district infuse a lot of resources into the school. Her father, a tax attorney in Tulsa, served as an early role model. He fought to establish fair voting districts in the city—the existing system underrepresented densely populated lower-income neighborhoods dominated by African Americans. “He got threatening phone calls and was harassed. But he didn’t back down,” Fox recalls. It was a later conversation with her father that finally set Fox on the path to her profession. She had just graduated from high school and was taking a gap-year (before the term became fashionable), waiting tables and casting about for a clear direction. The things she was interested in, she told her father, didn’t seem to have any academic application. Fox is not an “armchair” sociologist—her research takes her to places most people don’t want to go but where the magnitude of need and opportunity for positive change are the greatest. 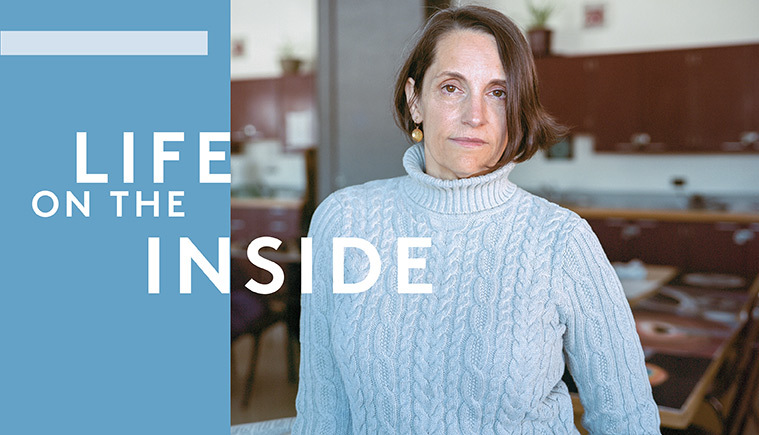 Her doctoral dissertation at California-Berkeley focused on a prevention program for intravenous drug users on the West Coast, most of them homeless and at high risk of contracting HIV from sharing needles. Fox conducted qualitative research on the program, and in the process, provided free condoms and taught addicts how to clean syringes. She joined the UVM faculty in 1994. Teaching introductory classes and seminars in criminal justice, her research interests turned increasingly towards offender reentry and reintegration in Vermont. Fox increasingly began to see higher education as a key lever to change the lives of inmates and improve outcomes after their release. She also became convinced of the societal benefits of education on the “inside”—providing higher education reduces recidivism and dramatically improves the odds that returning citizens could become successful, crime-free, tax-paying members of society. The recidivism rate in the state, while better than the national average, has hovered at about 45 percent for the last decade. Incarcerated citizens who are released with a high school education have a recidivism rate of 24 percent. That drops to 10 percent for inmates with two years of college, and about 5 percent with four years of college. “Vermont, like the rest of the nation, is investing vast sums of money in a correctional system that has the potential to deliver better results,” she says. Fox is a great believer in experiential learning, and bringing her UVM undergraduates into the prison provides them with a first-hand look at lives of the incarcerated. The learning is a two-way street—inmates learn academic content alongside UVM students in a classic college seminar while the undergrads develop a sharpened sensitivity to the obstacles inmates face in their day-to-day lives and long-term prospects. The class typically sits in a circle, with UVM undergrads and students from the prison seated next to each other. It is one of the few times in the inmates’ weekly routine that a uniformed officer is not present in the classroom. “A big obstacle was breaking down the walls as much as possible. Both groups were a little intimidated so we did some ice breaking exercises to establish the things we all have in common. For instance, I’d propose they talk about what their one food would be if they were stranded on a desert island,” Fox says. There would be laughter—nervous at first, then more spontaneous—as the students discussed the merits of a diet consisting of pizza versus ice cream. “The best way to understand our criminal justice system is to talk to people within it, from all angles,” Fox says. The impact, she hopes, will be that the shared human experience will affect UVM students as they go forward in their professions. If they someday work in a management role, for instance, maybe they’ll hire a formerly incarcerated individual. Sociology major Sarah Bull ’17 worked with Fox as a teaching assistant for the course. In addition to the Monday afternoon class, she spent an hour each Wednesday evening in the facility meeting individually with classmates to answer questions and help them with assignments. One of the “inside” students who was recently released, wrote to Fox saying she never imagined she could go to college, but feels that she can after being part of the course. As the program continues to take root at UVM, that’s a result the professor behind it hopes will repeat many times over.